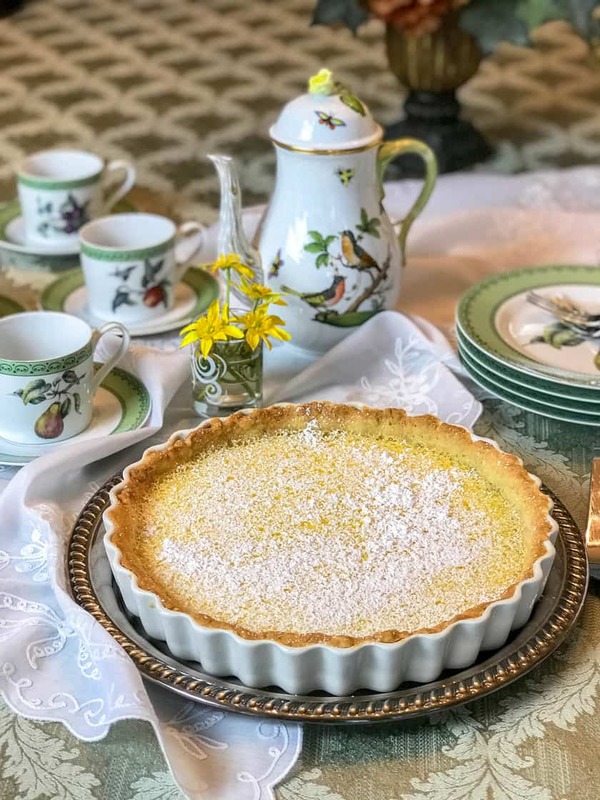 This Lemon Tart with Shortbread Crust is a simple and incredibly easy dessert for brunch or afternoon tea. Or when you’re craving that indescribably delicious taste of citrus. Infused with freshly squeezed lemon juice, it’s creamy and lush and simply sweetened. 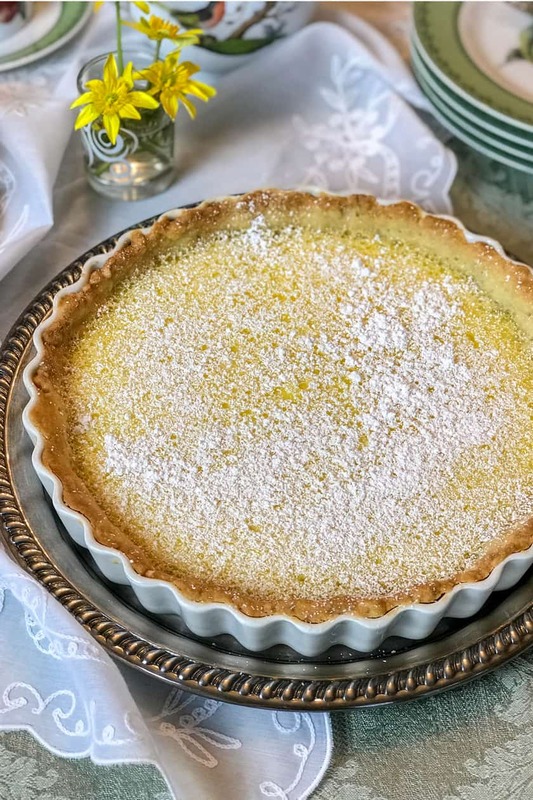 Similar to lemon tarts served in Scotland and all over Britain, this is a simple tart with simple ingredient and simple baking instructions. What Kind of Tea to Pair with Citrus Desserts? 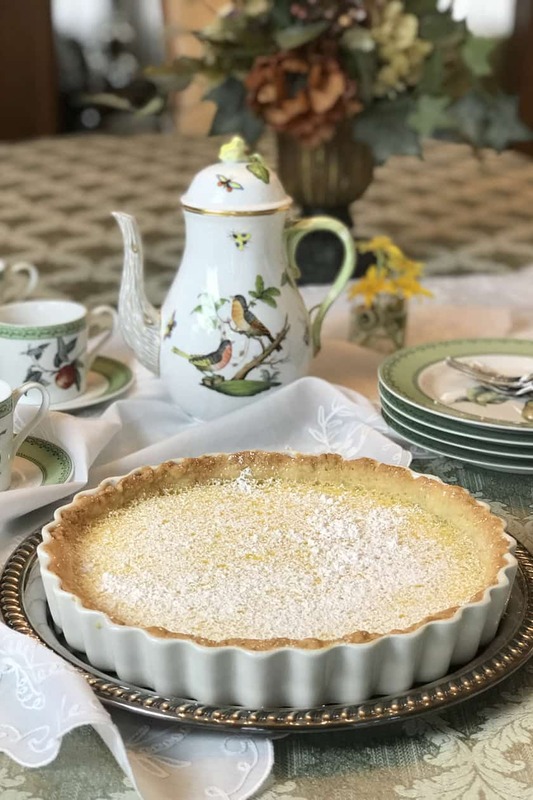 Just in case you’re longing for a cup of tea with a slice of this incredible lemon tart, you may want to know which tea to pair it with. 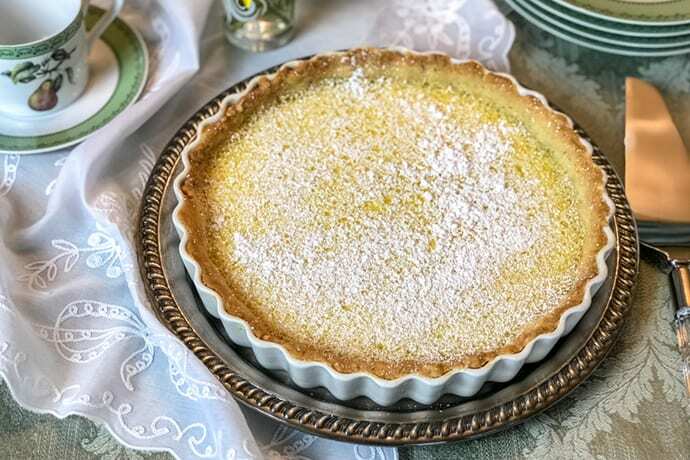 This Lemon Tart is easily made in two short steps. Making the crust: The shortbread crust is made from 4 simple ingredients; flour, melted butter, confectioners’ sugar and a dash of salt. It comes together in seconds with the melted butter. And here is the best news of all. There is no need to roll out this dough! A quick press into a prepared tart pan followed by a 20-minute blind bake in the oven. And then… you’re already halfway there. Making the filling: The lemon filling requires only 4 ingredients. I told you this was easy! In a medium-size bowl, whisk together cream, sugar, eggs, and freshly squeezed lemon juice from two lemons. And then pour in into the cooled, baked tart shell. Bake for 35 to 40 minutes or until the tart is set in the middle. This Lemon Tart was made using a fluted 10-inch tart shell without a removable bottom. The following recipe is written for this size baking pan. However, you can also substitute a cake pan in a similar size. Whichever one you plan to use, butter it well so the tart can be easily removed from the pan. When serving the Lemon Tart, I like to liberally dust with confectioners’ sugar. But freshly whipped cream is incredibly delicious too! Preheat the oven to 375 degrees F and butter a 9-inch or 10-inch tart pan or cake pan. Set aside. In a medium size bowl, mix together the flour, melted butter, confectioners’ sugar, and salt until it forms a soft dough. 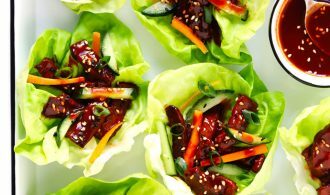 Then press it into the base of your prepared pan and press up the sides. Dock the dough with a fork so that it bakes evenly. Bake the crust blind in the preheated oven for 20 minutes. Remove from the oven and cool while you make the lemon filling. 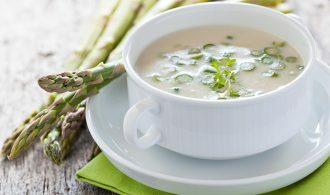 Reduce the oven to 300 degrees F.
In a medium bowl, whisk together the cream, sugar, eggs, and lemon juice. Pour into the cooled tart shell and returned to the oven; bake another 35 to 40 minutes or until the filling is set in the middle. Once the Lemon Tart is baked, remove from the oven and cool completely on a metal rack. Once cool, and right before serving, dust with confectioners’ sugar and cut into wedges. I like to allow the tart to cool slightly and then refrigerate until it’s completely set; about 2 hours.